And then it was October.. Also known as my favorite month of the year! There are many reasons why this is true, but mostly it's a time of transition. Metaphorically speaking of course. September was a time for me where I wanted to re-introduce creativity into my daily life. I have always enjoyed art and photography and creative writing to a point. I feel like as I've gotten older I have pushed those things out and replaced them with past times that weren't quite as important to me. I vowed to write in my journal every day in September. Well sadly I didn't write in my journal everyday, but I did write 20 of the 30 days, which is a pretty good if you ask me. On days I didn't write in the journal I was writing drafts for upcoming blog posts or assignments for my writing class. I still feel like I accomplished this goal for the month. I did more writing than I have in a long time. I am going to keep this goal open and see where it goes. I had plans to collaborate with a few ideas for October but I didn't get them all established. I am however hosting my first giveaway on the blog! (You should enter! It's open until Thursday!). So I would say even though I didn't get all of my ideas out, I did accomplish one. I will keep this goal open for the rest of the year and see where I'm out in 2016. I was aiming to reach 10,000 views for the month and I sold myself short by taking a blogging break. I am do not regret taking the break but it did affect my stats. There is always next month right? I took a blogging break to help myself re-focus. I feel like this break helped me do better with planning out my posts. I have been able to find more time to set aside for blog related activities. I am spending more time on my writing. photographs, and interacting with the blogging community. I would say I did a great job on this and will continue to practice this into the future. I feel like I accomplished a lot in September. There were definitely some set backs but I came out of everything with a better attitude and less stress. Now to move into October. I want to focus on confidence. That will be my Happy Project word. Now what I want to accomplish. Finish my writing class. Start researching more classes to better enhance my writing and business skills. This blog is my second job and it's about time I start treating it like it is. Send out 2 pitches to brands I am interesting in working with. I am ready to start monetizing my blog and this is something I need to do. I need to get over the nervous hump and just do it. The worst that can happen is the word no right? Post more photos of myself. I know this sounds vain but it is a confidence issue I have. This blog is about me and my life so it is about time I start showing you who I am. This is the goal I am most afraid of. Wish me luck. 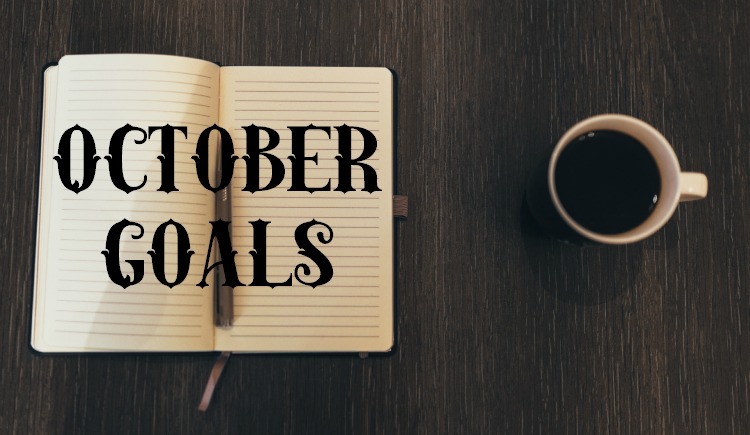 What are your plans and goals for October? Have any fun things planned? Keep up with me as I start showing you who I am and where I want to go with this. Happy Tuesday!